This overland adventure takes us from Bangkok over the border into Cambodia, where we have the chance to explore the ancient temples of Angkor as well as delve into the vibrant capital of Phnom Penh. 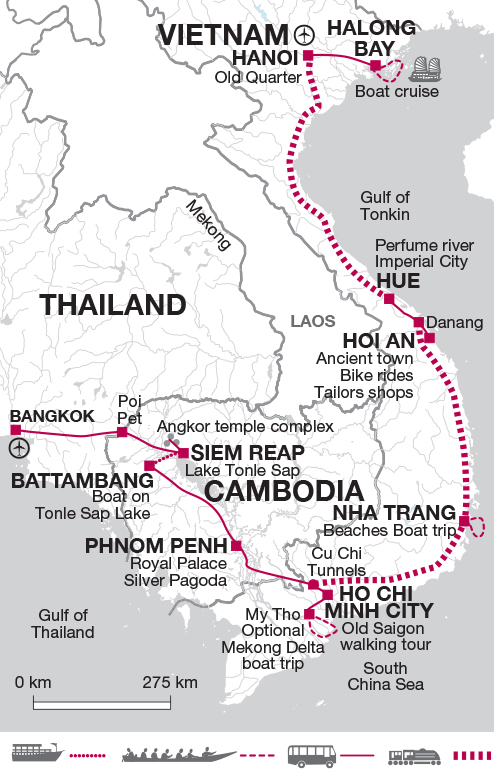 Our journey continues to Ho Chi Minh City and the Mekong Delta, before we venture north along the Ho Chi Minh trail via the beaches of Nha Trang and ancient towns of Hoi An and Hue. We end in the north in Hanoi and the iconic Halong Bay. Arrive Bangkok and check-in at the hotel. If your flight time allows you may choose to take an optional cruise along the city's Klongs (canals) in a traditional longtail boat. This is the ideal way to explore Bangkok's network of meandering waterways that branch off from the main channel of the Chao Phraya River. The excursion will also include visits to the Royal Barge Museum and the iconic Wat Arun, the Temple of the Dawn, which was built to represent the towering slopes of Mount Meru, the home to the gods of Khmer mythology. This morning we make an early start with a train ride before boarding a scheduled bus service to the Cambodian city of Siem Reap. Operated as a through service, travellers will nevertheless change vehicles once in Cambodia. Your Thai leader will accompany you to the border and you will then meet your Cambodian Tour leader to continue your journey by local bus to Siem Reap. Today is left free to explore the incredible jungle temple complex of the Angkor period, whose history covers some 600 years, from the 9th through to the 15th centuries. No activities or excursions have been included in Siem Reap and your time here is very much your own, although your tour leader will be more than happy to help organise any visits that you wish. Two of the best ways to explore are by bicycle or striking a deal with one of the many tuk tuks that ply their trade here. Obvious choices are the magnificent complex of Angkor Wat, without doubt one of the most incredible of the jungle sites, the fortified city of Angkor Thom (home to the Bayon, with its mysterious giant faces) and the wonderfully overgrown and atmospheric Ta Prohm, set amidst tangled tree roots and lush jungle and famous as the setting for some of the Lara Croft film Tomb Raider. Other possibilities include taking to the waters of the Roluos River, to visit the floating villages and local wat at Kompong Phluk and explore the flooded forest and great lake of Tonle Sap (the largest freshwater lake in SE Asia, covering nearly a seventh of Cambodia's entire landmass). Those wishing to gain a little understanding of Cambodia's more recent past might like to seek out the fascinating Landmine Museum just to the south of Banteay Srei Temple. Set up in 1997 by a former Khmer Rouge soldier, the museum offers support for countless victims of landmines, as well as providing visitors with a poignant reminder of one of the country's most violent and tragic periods. Today is left free to explore the incredible jungle temple complex of Angkor. Today we travel by public bus from Siem Reap onto Battambong, a journey of approximately 3 hours. Battambong lies along a route that has seen countless Thai and the Khmer Rouge soldiers wind their way north and south, either in the pursuit of conquest, or in the case of the Khmer Rouge to escape the invading Vietnamese in 1979. The town is, surprisingly, Cambodia's second largest, a factor that has done little to detract from its laid-back feel, enhanced by a wealth of colonial villas and leafy streets. Depending upon our arrival time there may be an opportunity to explore this afternoon, taking in its traditional temples and French-colonial architecture. A public bus takes us on to the Cambodian capital this morning, the 6-hour journey getting us to the city in time for an afternoon's orientation tour. Phnom Penh sits at the confluence of the Sap, Mekong and Bassac Rivers, a charming testament to the country's ancient and colonial past, with tree lined boulevards and colonial villas dotted amongst the reminders of its turbulent history. The Cambodian capital since the mid 15th century, Phnom Penh's origins lie in the legend of 4 statues of Buddha, washed on the shores of the Mekong and discovered by a woman named Penh, which were later housed in the 14th century Wat Phnom, located on a small hill at the northern end of the city. On arrival there should be time to freshen up, after which you may join your tour leader on a short walking tour of the city. Today has been left free for you to continue exploring this fascinating city at your own pace. Options include the National Museum, with its impressive collection of Angkor statues and the impressive French built Royal Palace, whose spectacular pagoda style structure is without doubt one of Phnom Penh's most impressive sights. A replica of King Norodom's old wooden palace, the building presents an ostentatious display of elaborate Khmer architecture, with golden nagas, orange, sapphire and green tiles and scenes from the Ramayana painted on the ceiling. The Tuol Sleng Genocide Museum and the 'Killing Fields' of Choeung Ek provide gruesome testaments to life under the Khmer Rouge and Pol Pot, the skull filled glass tower a vivid memorial to the 17,000 men, women and children who were murdered there between 1975-1978. You should be aware that by their very nature Tuol Sleng and the 'Killing Fields' can be a distressing experience for some people. You might like to take a trip along the Mekong, or perhaps visit some of the capital's numerous markets, such as the old Russian Market of Psar Toul Tom Poung, renowned for its textiles, jewellery and antiques. Of course you may just prefer to wander Phnom Penh's vibrant streets, soaking up the atmosphere and perhaps enjoying a drink in one of the city's old colonial riverfront bars. Transferring to the bus station this morning, we catch the non-stop public bus to Ho Chi Minh City, an unescorted journey of some 6.5 hours that gets into the city in time to meet up with our Vietnamese tour leader. We cross the border at Bavet (Cambodia) and Moc Bai (Vietnam). Lying to the north of the Mekong Delta, on the banks of the Saigon River and still unofficially referred to as 'Saigon', the city today is the largest in Vietnam, an eclectic mix of the traditional and the new, where pagodas and markets compete alongside the trappings of Vietnam's newly discovered entrepreneurial spirit. Depending upon our arrival time we plan to make a short orientation tour on foot around the city, taking in some of its more obvious highlights, including the prominent Hotel de Ville, whose ornate grandeur is today the home of the city's People's Committee, as well as the Romanesque Notre Dame Cathedral and the impressive French style edifice that is the GPO building (should our arrival time render this option impossible, then we will do the tour tomorrow morning instead). Today is free for you to choose from a number of options. You may wish to visit the remarkable Reunification Palace and the emotive War Remnants Museum, which contains a fascinating, and at times chilling reminder of the cost of what the Vietnamese refer to as the American War. Or perhaps browse the bustling stalls of the Binh Tay Market, the largest wholesale market in southern Vietnam and a fabulous place to stroll and meet the locals. This morning you'll meet with the rest of the tour passengers for our Good Morning Vietnam Tour and continue the trip with them. Today sees an opportunity to journey down into the Mekong Delta and explore the fertile hinterlands that lie sandwiched between the South China Sea and the Gulf of Thailand. Heading down towards the town of My Tho takes you into a region where the orchids, lychees and coconut palms that are grown in the delta are bartered at breakneck speed and taking to the waters you have a chance to enjoy the timeless tableau of river life that has continued pretty much unchanged for generations, visiting local villages and floating along the narrow tree-lined canals of the Mekong. There will be an opportunity to take lunch on one of the islands, before returning to My Tho by boat to make the return journey back to Ho Chi Minh City. This evening the group transfers to the city's train station by taxi, in order to catch the overnight train to Nha Trang. Early this morning we arrive in Nha Trang and transfer to the hotel. Given the early hour of our arrival, dayrooms are provided to freshen up prior to our own rooms becoming available. The day has been left free to explore Nha Trang at your own leisure and the town's picturesque location, amidst a golden landscape of white beaches and blue waters, makes it an ideal spot to enjoy some quality beach time. Other options include a relaxing mud bath, or perhaps a boat trip out to the islands that lie offshore with the chance for snorkelling. Those looking for something a little more active might like to consider a trip by bicycle to explore the nearby Cham Towers and the old part of the town. Probably Nha Trang's most iconic attraction, the Po Nagar Cham Towers span a period of some 500 years and present a haunting reminder of the long forgotten kingdom that once ruled these lands through their divine kings. Only 4 of the original 10 towers remain (many were destroyed during the intense fighting of the Vietnam War), but nonetheless they conjure up an impressive feeling of power and mystery and, along with the remnants of Nha Trang's past and the captivating sights of its fishing villages present an enthralling introduction to the town. Another full day in Nha Trang offers the chance to continue with some personal sightseeing, or perhaps enjoy a little more of the beach, before we transfer to the railway station for an overnight train to Danang. On arrival in Danang we will continue our journey by charter bus to Hoi An. On our way we pass the popular beach resort of My Khe, better known as China Beach, an area that during the Vietnam War was popular with the American GIs on RnR. Given the early hour of our arrival at the hotel we might not be able to check-in so we plan to store our bags, have breakfast (not included) then embark on a walking tour of Hoi An. First colonized by the Portuguese in the 16th century, by the 17th and 18th centuries Hoi An had become one of the busiest international trading posts in southeast Asia and, even today, it still retains the engaging charm of a medieval port, with many of its old buildings superbly preserved. Highlights include the Phuc Kien Assembly Hall, a pagoda dedicated to the worship of Buddha originally built by the Vietnamese people in the 16th century and the 400 year old Japanese covered bridge. We end at the colourful riverside market, a perfect setting for exploring, the rest of the day is free to enjoy as you wish. Today is free to wander through the historic heart of this World Heritage Site at your leisure. An early morning visit to the fish market presents a riot of noise and colour that is perfect for some great photo opportunities and some choice local interaction. You might also like to pay a visit to the Japanese Bridge, Hoi An's emblematic symbol, believed to have been constructed to quell the violent rumblings of a restless monster, or perhaps explore the traditional wooden houses and Chinese temples that line the streets. There are numerous tailors shops in Hoi An providing an incredibly cheap and quick service and almost all visitors have at least one item made before they depart. Hoi An is also a great place to hire a bicycle as the roads are relatively quiet. There's a good beach just a few kilometres from the town or alternatively why not set out to explore nearby villages. Cooking classes are yet another option available in this popular travellers hangout. This morning sees us heading along the coastal road towards the historic setting of Hué, crossing part of the Truong Son Mountains and travelling via the Hai Van (Sea Cloud) Pass. This stunningly scenic region once marked the boundary between Vietnam and the Champa Kingdom to the south and the journey should get us into the old imperial city around lunchtime, after which the rest of the day is free for personal exploration. Once the capital of Vietnam and an inspiration for poets and artists alike for centuries, Hué is divided by the waters of the Perfume River, which separate the city's 19th century citadel from the suburbs that radiate from the eastern shore and, even today, its easy air of leisurely ambience makes it one of the most engaging cities in the country to explore. With the better part of the day to enjoy the city, Hué offers a wealth of options to make the most of your time here. You could pay a visit to the iconic Thien Mu Pagoda, home to the oldest monastery in the city, whose 21m high tower has become something of a symbol for Hué. Dedicated to the Manushi- Buddha, the existing temple was constructed in the middle years of the 19th century, under the auspices of the Emperor Thieu Tri, and within its confines you can find a number of superb Buddhist statues, as well as an enormous cast bell that weighs in at over 2000kg and is reputed to be audible over 10km away. Another alternative is to spend some time exploring the Old Citadel that dominates the left bank of the Perfumed River. Built by the Nguyen dynasty (Vietnam's ruling emperors from the early 1800s to1945), the Citadel has formal moats and impressive ramparts that were constructed to be an exact copy of the Forbidden City in Beijing. During the bloody conflicts of the Vietnam War, Hué was the site of some of the most destructive fighting of the Tet Offensive, most of the Inner City being totally destroyed during the month-long battle in 1968. The vast outer walls and the West Wing remain though and provide an eloquent reminder of the palace's former glory. Farther afield, amongst the forested landscapes of the Perfume Valley, you can find the Royal Tombs of the Nguyen kings, the unique mausoleums of the emperors that provide an ideal destination to explore by bicycle. Later this afternoon we will then head for the railway station to board the overnight train north to Hanoi, Vietnam's vibrant and historic capital. Arriving in Hanoi in the early hours of this morning we disembark the train and transfer by road towards the Bay of Tonkin on Vietnam's northeast coast. Our destination is the breathtaking setting of Halong Bay one of Vietnam's, and indeed Southeast Asia's, most spectacular natural attractions, whose staggering beauty has seen it listed as one of the eight natural wonders of the world. A UNESCO World Heritage site, Halong Bay presents a quite extraordinary vista of hundreds of limestone islands (over 1600 at last count) that rise from the jade green waters of the bay like the scales of some great submerged dragon. Indeed Halong means 'where the dragon descends to the sea' and local legends tells of a time when this rugged landscape was created by the pounding tail of a mighty dragon as he ran from the mountains into the glittering waters of the bay below. On arrival we will board our junk and set sail, threading our way through a flotilla of boats, junks and wooden sampans as they ply their way across the gentle waters of the bay. The plan for today is to sail through this stunning seascape, stopping off to swim and visit some of the limestone caverns that pepper the landscape. Later this evening we disembark from our boat and transfer to our hotel in the Bay. Returning back to Hanoi your tour leader will then take those that wish on a short orientation tour of the city, wandering the streets of the city's Old Quarter, whose narrow streets are named after the various crafts and specialities of the city's artisans: Paper Street, Silk Street, Basket Street etc. This practice dates back to the 13th century, when the city's original 36 guilds established themselves here, adopting a street each to differentiate them from their neighbours. The maze of alleys and streets present a fascinating venue to explore on foot and the area is known for its interesting 'tube' houses, where the narrow frontages give way to long rooms that stretch back from streets, whose pavements are littered with food sellers tempting passers by with all manner of noodles, snacks and stir-fried delights from shoulder panniers. Later today there may be a chance to witness a remarkable performance of traditional water puppetry, a practice that dates back to the 15th century and is deeply ingrained into the cultural lives of the peoples of the Red River Delta. Set on a flooded stage, the stories tell tales of legendary heroes and everyday life, with dragons and unicorns sharing the stage with ducks and frogs, and even fireworks and naval battles. Architecturally styled like a French provincial town, with tree-lined boulevards and substantial low-built houses, Hanoi is a wonderfully nostalgic city to enjoy and amongst its more interesting sights are the charming One-Pillar Pagoda, the Temple of Literature and the Presidential Palace. Ho Chi Minh was a spartan-living and scholarly man, who chose not to live in the Presidential Palace itself, but instead preferred a simple teak 2-storied stilt-house specially built for him in the grounds. You can visit his museum and this austere mausoleum, said to resemble that of Lenin in Moscow, or perhaps taking another walk through the engaging streets of its Old Quarter. The city's French Quarter is a great place to explore by bicycle, its grandiose colonial architecture offering up a rich contrast to the more frenetic pace of the old city, whilst those looking to discover something more of the colonial wars might like to pay a visit to the Museum of Vietnamese Revolution or the Military History Museum. Tour ends after breakfast. If you have time you may wish to take another wander through the fascinating Old Quarter or stroll along the shore of Hoan Kiem Lake. The prices stated are based on a minimum of 5-6 participants. Please be aware that the optional excursions can run with fewer people but the price may be higher. Likewise, a slightly reduced price may be applicable where the participation is greater. In Vietnam these excursions are generally run via our agent in the country. Local companies may offer similar excursions at a cheaper price. Should you want to use these companies please be aware that a lower price may mean that not all costs are included (entrance fees etc.) or services will not operate at the same safety and quality standards. Pack essentially for hot weather. Bear in mind that the region is tropical (humid) and that days can be very hot. Lightweight rainwear or an umbrella is advisable at any time of the year, but especially between May and October. Casual clothes are the most practical (something with long sleeves, and long trousers for evenings). Bear in mind that 'short\ shorts are generally unacceptable and a sunhat is essential. Shorts, vests, revealing or casual clothes and open backed sandals are not permitted in the Grand Palace in Bangkok. Comfortable shoes and sandals/trainers for relaxing. use local buses throughout this tour you might have to carry your baggage quite a distance in bus stations. Please also be aware that temperatures may be tropical. A torch, water bottle, insect repellent and high factor suncream are all essential, as are good quality sunglasses and a lip salve with sun protection. Don't forget your swim wear! Although entirely voluntary, tipping is a recognized part of life in this region of the world. Some local staff will look tomembers of the group for personal recognition of particular services provided. In order to make things easier for you, the Tour Leaders may organise a group's tips kitty and if this is the case, they will account for it throughout the tour. Accordingly you should allow US$60 for tips. On this tour we have opted for simple, basic and clean accommodation that provides value for money and a warm welcome. All hotel rooms have air-conditioning and attached bathrooms. Expect rooms to be furnished in a no frills manner and be prepared for both electricity supply and plumbing standards to be somewhat erratic. Visiting Thailand, Cambodia and Vietnam this adventurous journey is perfect for travellers who want the convenience of having their travel arrangements planned for them but the flexibility to tailor their exploration in each destination as they wish. You travel mainly by public transport, so some early starts and long journeys can be expected, however, you are rewarded with plenty of free time to discover the unforgettable highlights in each destination.